Inspecting coarse grained materials using ultrasonics is severely limited due to the scattering of the ultrasonic signals on the grain boundaries of the material. 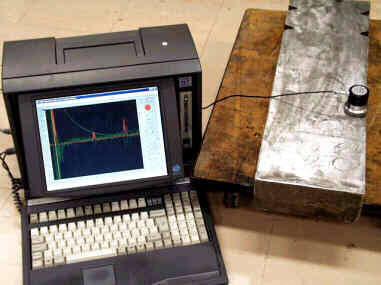 A novel technique of performing ultrasonic inspections on these materials has now made it possible to inspect castings as though they were forgings. Most physical phenomena from atomic scale to that of the universe are explained mathematically by the use of a few additional dimensions. These include the unifying theory of matter to a number of big bang theories. The mathematical addition of a dimension to an ultrasonic problem can also lead to astonishing results, as is the case to the inspectability of large castings. The compression of the crystal (deflection) with respect to time is a one-dimensional signal. However by acknowledging that this is only a measure of the potential energy of an energy vector, we can also measure the kinetic energy in the signal and convert these two signals into a 2D or complex plane waveform. In the nuclear, petrochemical and aeronautics industries, a number of coarse-grained materials are routinely used. These include cast elbows on nuclear plant, turbine blades on aircraft, ceramic components and even concrete structures. The volumetric inspectability of these components has been severely limited since their geometries preclude radiography, while grain noise swamps the signals when using conventional ultrasonics. A number of techniques have been developed that use frequency domain information such that the grain noise can be reduced. All these techniques (generally known as split spectrum processing or SSP) have the disadvantage that linearity is lost, while probability of detection is only marginally improved. Another disadvantage of these techniques is that the processing power required for implementing SSP has limited its use to research laboratories. Convention ultrasonics uses the time domain signal to determine the depth and reflected power (function of size, surface finish and orientation) of indications. Split spectrum processing makes use of additional frequency domain information such that the time domain signal can be enhanced. Historically, split spectrum processing used this information such that if a signal contained all frequencies at an instant in time (depth), it was classified as an indication, while if frequency components were missing, it was classified as grain noise. Real indications are rarely perfectly perpendicular to the wave front as modeled in figure 1. A typical example of this problem are the curved sides of side drilled holes. In figure 2, it can be seen that a signal may have its high frequency component leading the low frequency component (or vice versa), since it is reflected at the point where the indication width is equal to the wavelength. Using this figure, it can be plainly seen that split spectrum processing will be useless, as the indication will be seen as grain noise and be filtered out. Fig 1: Frequency response of an indication vs. grain boundaries. Fig 2: Modified response comparison. If instead of using the amplitude of the various frequencies in the SSP comparison, we now use the phase information (time domain phase), we can see that a real indication will have all frequencies approximately in phase, while a grain boundary will have its various frequencies out of phase. A mathematical problem now arises: how do you calculate the phase of a signal at an instant in time? An ultrasonic probe or crystal generates a voltage proportional to its deflection. This deflection can be equated to potential energy. An ultrasonic probe therefore measures the reflected potential energy of sound waves coming from the inspected material. However a wave is composed of both potential and kinetic energy, and we are thus only measuring half the available information. If we can measure this kinetic energy, we can (in a manner of speaking) double our information. Measuring the kinetic energy of a sound wave is possible, however measuring both these signals at the same place and at the same time with two different probes is problematic. By the use of a Hilbert transform, this problem is avoided since the kinetic energy vector can be calculated from the potential energy vector . This calculation also eliminates the need for a second probe. Combining the kinetic energy vector and the original ultrasonic signal in one complex waveform can now be achieved by simply multiplying the kinetic energy vector by j (Ö -1) and adding the two signals. This complex signal can now be used to measure the phase of the signal at any point. A typical signal (captured on an austenitic casting 80mm thick) is shown in figure 3 above. Here the original signal is shown in gray, while the derived kinetic energy (causal signal) is shown in dotted gray. The total reflected energy (analytic magnitude) is the vector summation of these two signals, as shown by the black line. Once the complex waveform is obtained, it can be filtered through a number (n) of filters as per conventional split spectrum processing, however the filters now need to be complex filters, giving (n) complex output waveforms. These (n) complex waveforms are then compared to determine the phase difference between each waveform at each instant in time. From the theory presented previously, all frequencies must be in phase for a real indication, while for a grain boundary, they need not be in phase. We can therefore compare the phases of the filtered signals to distinguish between grain noise and indications. If the phase differences between the various waveforms are large, we are sure that it is grain noise, while if the phase differences are small we can be sure that the signal is an indication. The aggressiveness of our recombination technique is now determined by the range of phases we can assume as being an indication or grain noise. Since the grain noise depends on the inspection being performed, while the probability of detection depends on the indication criteria, the aggressiveness of the filter must be tuned for each inspection. The A-Scans shown in figure 3, is shown again in figure 4, where it is filtered using CSSP. In this case, six filters were used. By comparing the original signal (in gray) to the filtered signal, we can see a significant improvement in signal to noise ratio. In Figure 5 above, the green signal is the original A-Scan, while the red signal is the processed signal. Here we can clearly see a side drilled hole in the processed signal. CSSP has been used on a number of samples consisting of coarse grained material, ranging from austenitic steels, to brass castings. Materials tested include decontaminated samples from Koeberg's cast elbows (Nuclear power station in South Africa) while performance comparisons to that of the PISC program will be conducted shortly. The CSSP technique has also shown promise in both the sonar and radar field, and further extension of the technique in other fields is expected soon. Eskom TSI has patents pending for this technique. Equipment manufacturers, service providers and end users of ultrasonic inspections are invited to witness the technique first hand using their own 'difficult to inspect' samples. A technique called complex plane split spectrum processing (CSSP) has been developed. CSSP enables better sizing of indications, as well as improving signal to noise ratios. CSSP has been implemented on a prototype system capable of processing signals in real time. A technique now exists to inspect coarse grained materials such as the cast elbows of nuclear power stations.
" 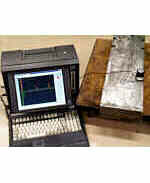 Signal processing ultrasonic testing system (SPUTS) using split spectrum processing algorithms" P.Rubbers, 2nd Int conference on NDE in relation to structural integrity for nuclear and pressurised components, EPRI, May 2000.